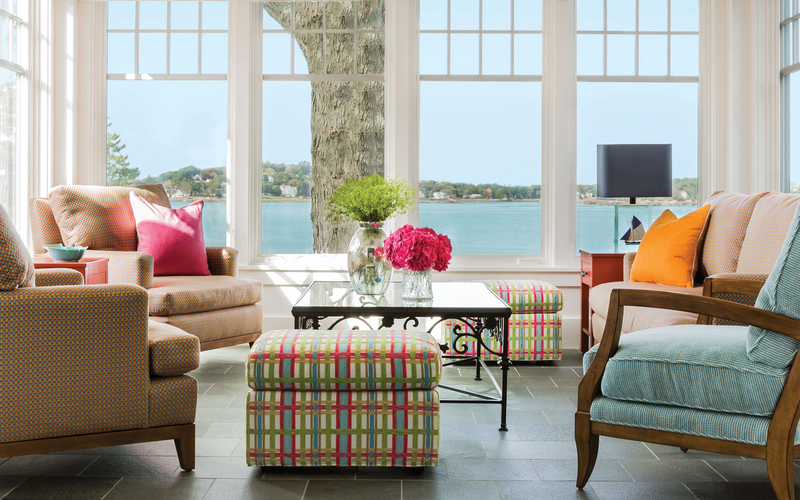 In this residential renovation we transformed this dated ranch home on the water into a vibrant and contemporary seaside retreat. Working closely with the architect and builder on this new custom home, we were able to create distinctive and inviting spaces, with elegant interior detailing. 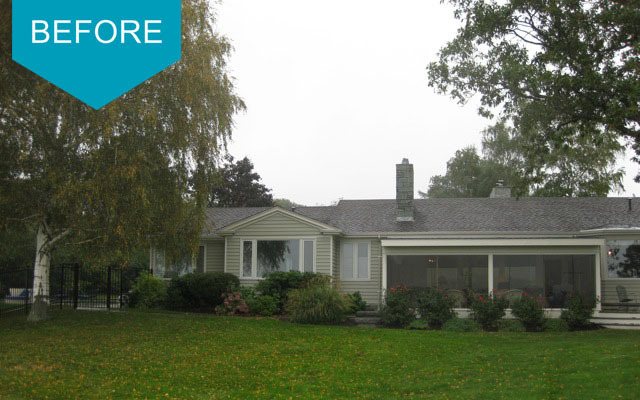 Keeping the original footprint for this residential renovation, the new home gained both space and architectural interest with the addition of a second floor on the previous single story home. 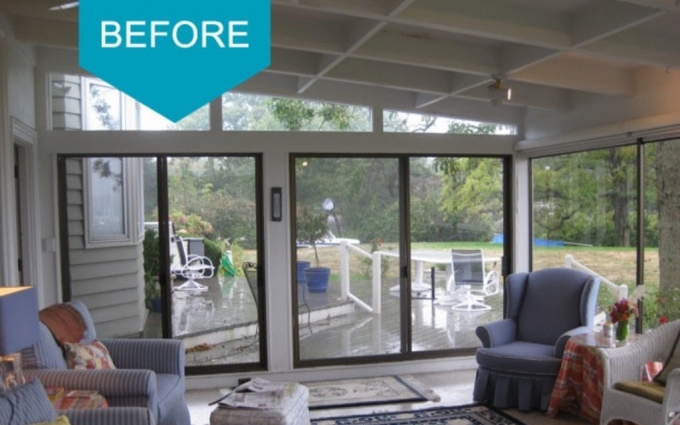 Prior to renovation, this sunroom was dated and drab. It lacked the feeling of a space for conversation or entertaining. 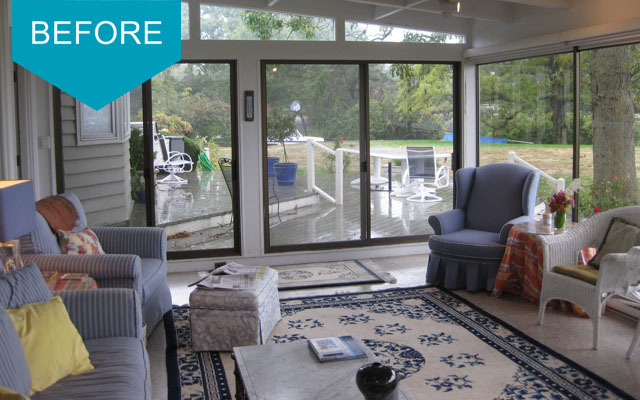 One of the highlights of this residential renovation include a new sunroom that is a comfortable and inviting space. 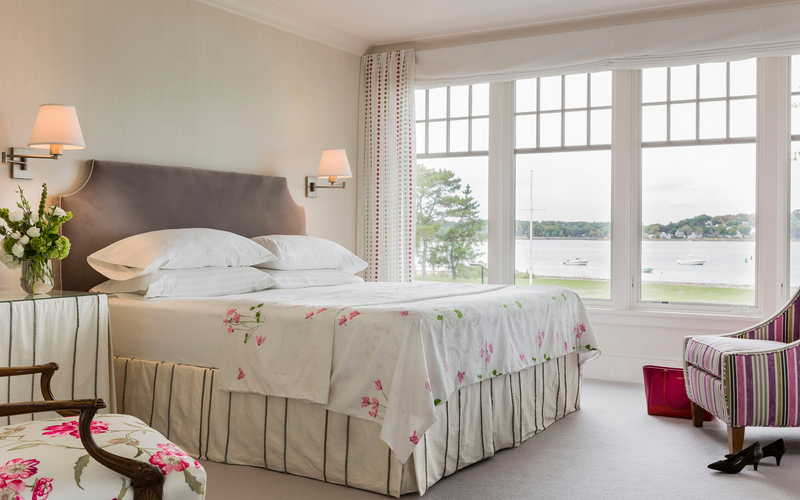 The new design takes full advantage of the beautiful water views and natural surroundings. 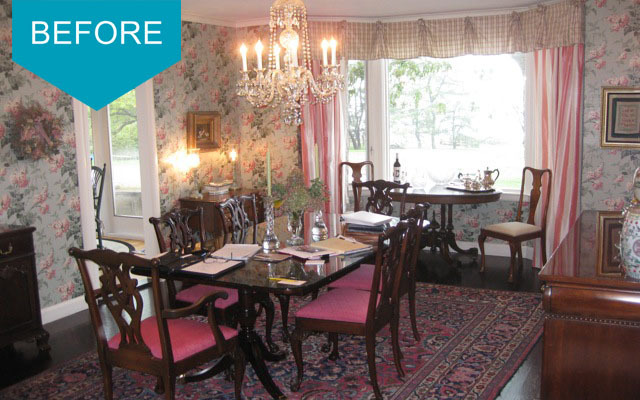 Before this magnificent residential renovation by Boston Interior Designer Elizabeth Swartz Interiors the dining room was very traditional and dated. It did have a nice big bay window to let lots of sunlight in, but the dark furnishings and busy wallpaper and rug detracted from the view. 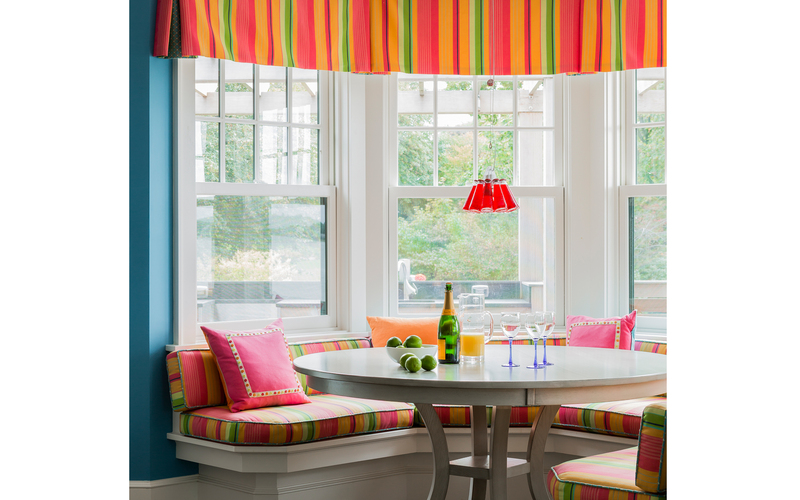 The beautiful bay window in the new dining room includes a casual breakfast nook with a custom built-in banquet in vibrant colors. The old kitchen was small, crowded and dated. It was quite inconvenient to work in. Not the ideal kitchen for a family who likes to entertain. 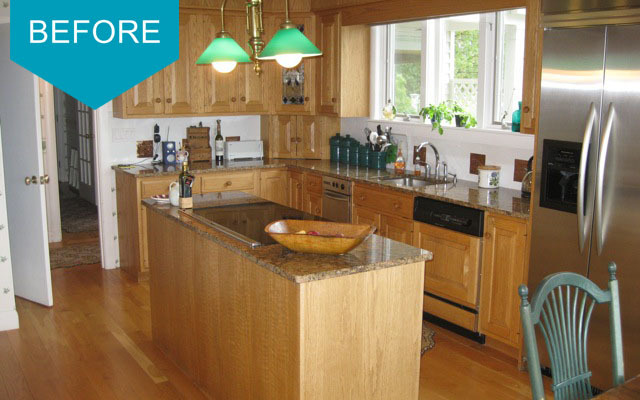 The new kitchen features custom cabinetry by Crown Point Cabinetry. 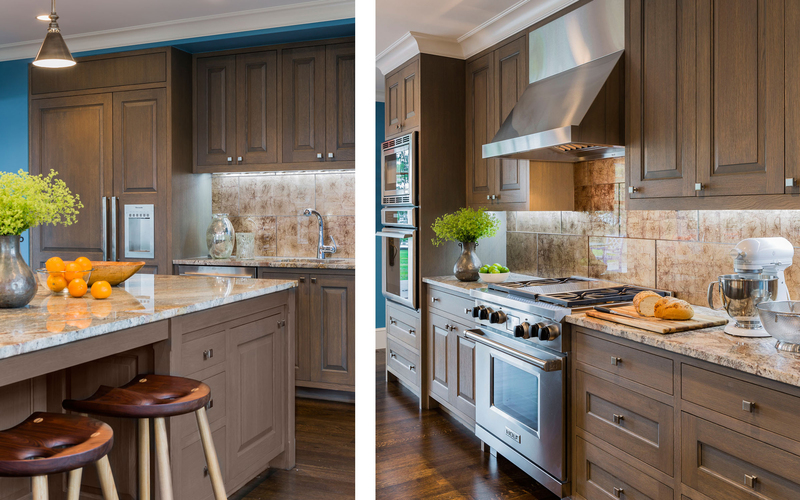 Natural stone countertops, a metallic glass tile backsplash and updated appliances transform the kitchen into a contemporary space for family entertaining. The original master bedroom had large windows and amazing views, but felt dark because of the oversized furniture, dark wood and closet that was built in the middle of the room. The new contemporary master bedroom is open and spacious. The pale and restful color palette of this room is in contrast to to the bold colors used in another areas of the home. In the old home, often the beautiful views were obstructed. And dark colors made the rooms feel small. 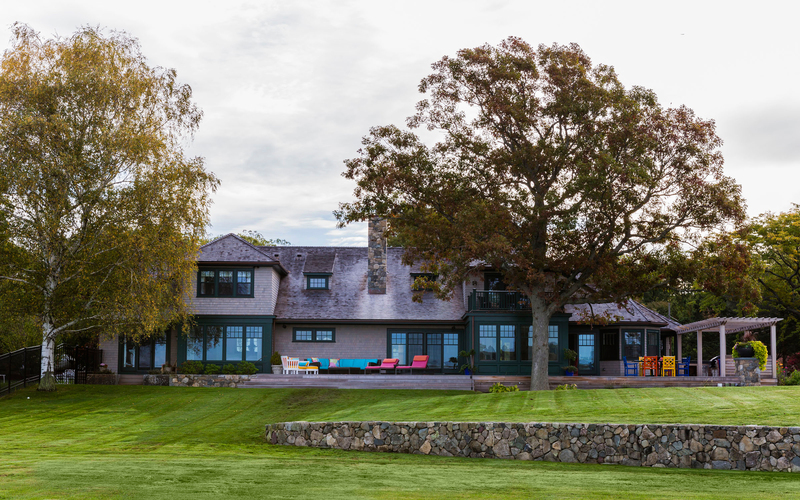 The new home embraces the wonderful natural light and beautiful waterfront views. 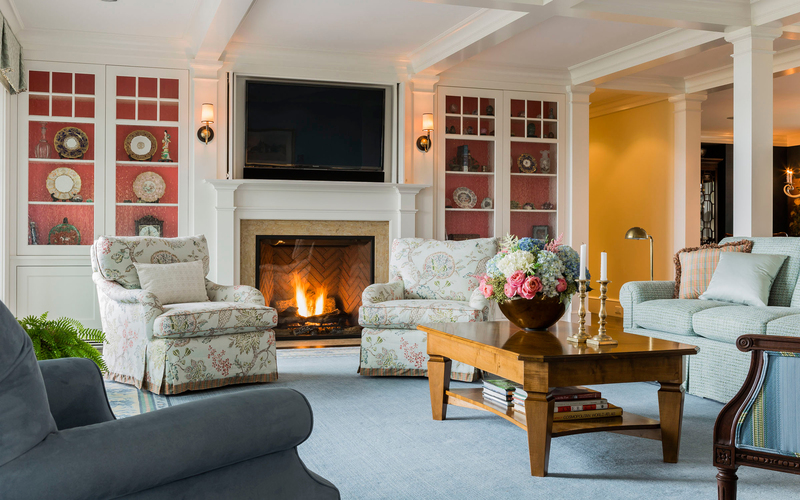 In the living room we chose custom cabinetry with traditional detailing to provide the homeowners a place to display some of their favorite things. This space is now perfect for gathering and entertaining. 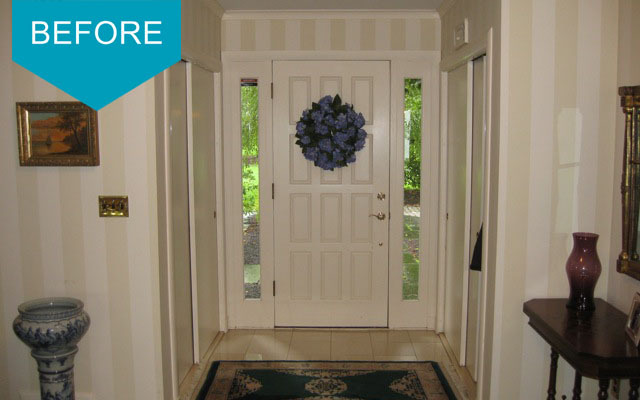 Before the complete home renovation, the foyer was confined, dark and dated. The new foyer keeps with the overall feel of the new home. It is light filled and inviting with custom paneling for detail. 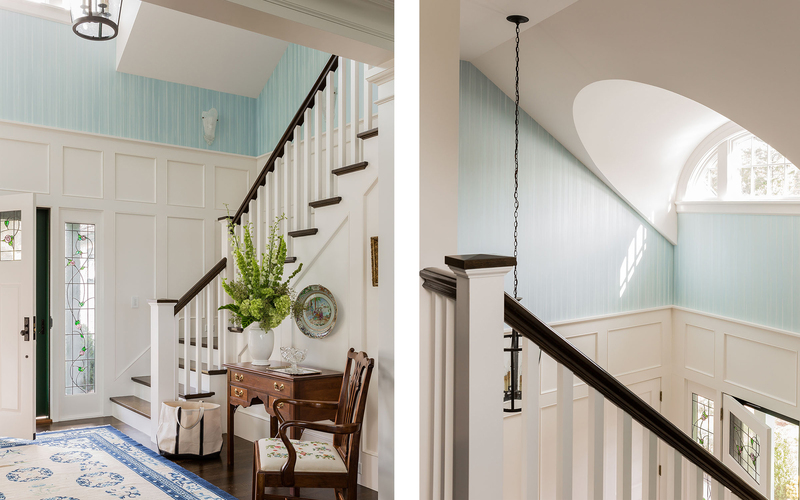 Traditional custom millwork allows this residential renovation to remain true to it’s original roots. Before the renovation, the deck was large, but did not take full advantage of the surrounding landscape to offer optimal enjoyment of the waterfront views. 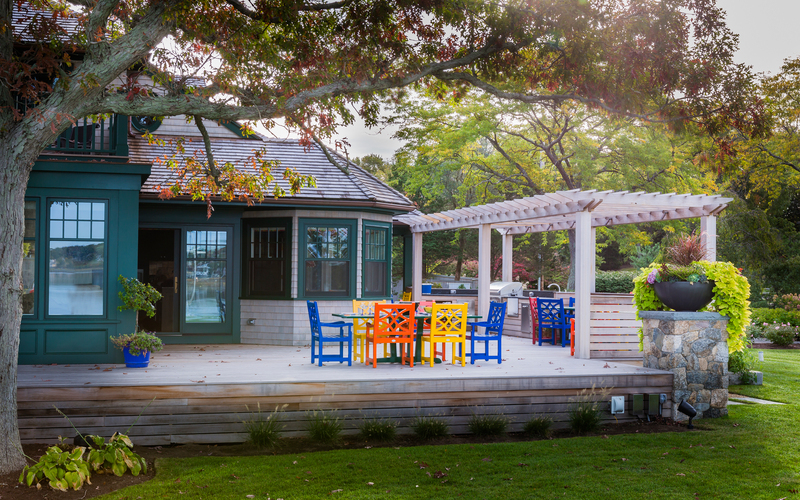 The new expansive deck includes a wonderful pergola, custom outdoor kitchen for entertaining, and vibrant furniture. 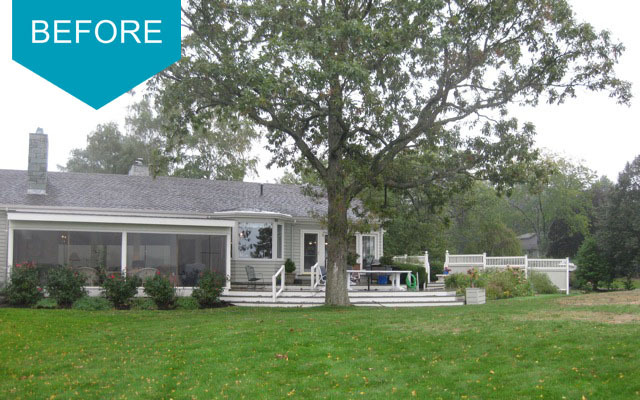 This spectacular residential renovation is featured in Cottages & Bungalows Magazine. 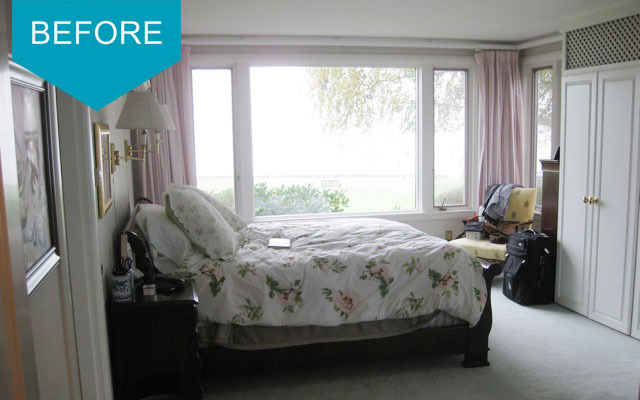 You can also view this complete residential renovation project in our portfolio. 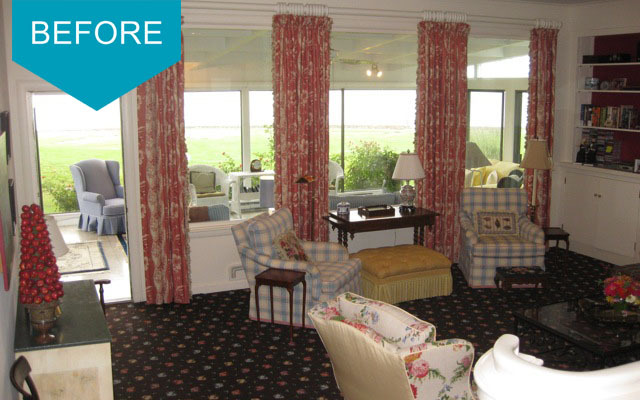 If you are looking to transform your home with a renovation, please be in touch.